Solvay offers the industry’s broadest selection of high-performance thermoplastics for implantable and non-implantable medical devices. We also provide global technical and regulatory support. With over 25 years of experience as a leading materials supplier to the healthcare industry, Solvay provides the commitment, experience and innovation that medical device manufacturers need from their partners. Based on biocompatibility testing as defined by ISO 10993:1, our healthcare products demonstrate no evidence of cytotoxicity, sensitization, intracutaneous reactivity or acute systemic toxicity. Compatibility with various sterilization methods is product specific and includes gamma radiation, ethylene oxide, vaporized hydrogen peroxide and steam. 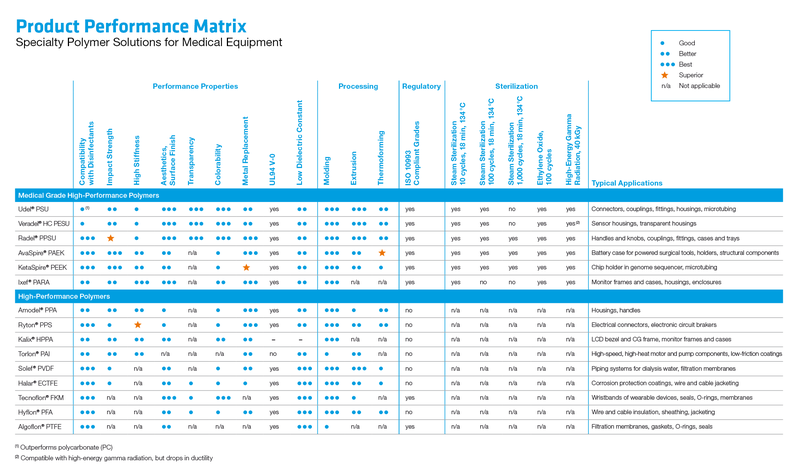 These categories represent areas where Solvay healthcare plastics are commonly used and do not imply fitness for use. Performance requirements for medical equipment, cases and trays, surgical instrumentation and other non-implantable medical devices vary widely, but they share a common need for the high performance that Solvay’s medical grade plastics provide. These materials are suitable for limited exposure applications that are in contact with bodily fluids or tissue for less than 24 hours. Solviva® Biomaterials are offered for use in implantable medical devices, specifically those that are in contact with bodily fluids or tissue for more than 24 hours. Our dedicated production facility in Georgia, USA, is ISO 13485 compliant and operates under the relevant aspects of current Good Manufacturing Practices. All materials are tested in accredited laboratories that have ISO 9001 certification and are ISO 17025 accredited. As a proactive partner with healthcare OEM’s for more than 25 years, we understand the stringent industry requirements designed to ensure biological safety and protect the public’s health, and we offer comprehensive regulatory support. With over 25 years of experience as a leading materials supplier to the healthcare industry, Solvay provides the reliability, experience and innovation that medical device manufacturers expect from their partners. Today’s broad range of medical equipment requires different performance requirements that benefit from our many different polymers. OEMs can also benefit from the proven performance of our products used in diverse end-use applications including automotive, smart devices, electrical/electronics, and the chemical processing industry. Solvay can be an added resource to your design and engineering team. We can provide the product development and technical and regulatory support you need to grow our business globally. Solvay’s healthcare plastics cover the gamut of sterilization technologies. Reusable devices are chemically washed and disinfected prior to any sterilization procedure. Those that are steam sterilized may be exposed to other chemicals, such as morpholine, which are often used in central steam sterilization systems to inhibit corrosion in the lines. For this reason, manufacturers should check performance under conditions that best simulate the intended use of the fabricated part in order to assess their cumulative effect on the material. (1) Veradel® HC PESU is compatible with high-energy gamma radiation but there is a drop in ductility. Stress can be caused by an external load applied during use or by a residual internal stress in the molded part due to processing. Residual stress can be minimized by adjusting processing conditions. It’s important to be familiar with a material’s performance under unstressed and stressed conditions as some reagents having no effect on unstressed plastic can cause cracking when stressed. The table below gives a general indication of the compatibility of our medical grade plastics with commonly used hospital disinfectants. Because performance and design criteria are application specific, manufacturers should check performance under conditions that best simulate the intended use of the fabricated part. This includes cleaning and disinfecting followed by sterilization in order to assess their cumulative effects on the material. Set yourself apart from the competition by using color to create a fresh, exciting look for your products. Colors can also provide a quick visual reference for differentiating sizes. Where transparency is important, consider Udel® PSU and Radel® PPSU resins, which in their natural state have a near water-white and light amber color respectively. They are available in a range of vibrant transparent colors that deliver a clear advantage over metal without compromising performance. 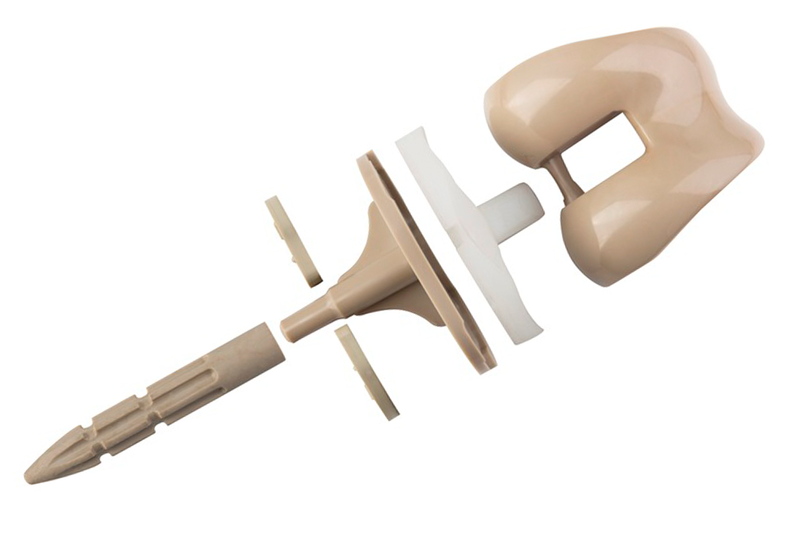 Solvay also offers a wide range of opaque colors for several of its medical grade plastics. Opaque and transparent Radel® PPSU colors and Ixef® PARA gamma stabilized colors are supported by FDA Master Access Files (MAF) and demonstrate no evidence of cytotoxicity, sensitization, intracutaneous reactivity or acute systemic toxicity. Custom colors available through partners. Solviva® is a family of biomaterials offered for use in implantable medical devices. Only products designated as part of the Solviva® family of biomaterials may be considered as candidates for medical applications implanted in the human body and devices that are in contact with bodily fluids or tissues for greater than 24 hours. Solviva® Biomaterials meet or exceed the highest industry standards in terms of quality and biological safety. Products are available for prolonged exposure (greater than 24 hours to less than 30 days) and permanent exposure (greater than 30 days) to bodily fluids and tissue in the human body. Solviva® products can be sterilized using all conventional sterilization methods, including gamma radiation, ethylene oxide and steam. The Solviva® family of biomaterials includes four distinct polymer chemistries, providing more options for meeting the needs of implantable devices used in orthopedics, cardiovascular, spine and more. Zeniva® PEEK (polyetheretherketone) is one of the most biostable plastics available with high strength and stiffness plus excellent toughness and fatigue resistance. Zeniva® PEEK meets the requirements of ASTM F2026-07 as a polyetheretherketone (PEEK) polymer for surgical implant applications. Veriva® PPSU (polyphenylsulfone) provides unsurpassed toughness combined with transparency and excellent biocompatibility. Eviva® PSU (polysulfone) offers practical toughness in a strong, transparent polymer. It is also available in opaque white. Solviva® Biomaterials are available directly from Solvay in both injection molding resins and stock shapes. Please contact us for individual data sheets. The entire line of Solviva® Biomaterials is manufactured in compliance with ISO 13485 and under the relevant aspects of current Good Manufacturing Practices. Solvay’s biomaterial manufacturing processes are carefully validated and enhanced controls provide product traceability. In addition, all materials are tested in an accredited lab that is ISO 17025 compliant. Solviva® Biomaterials, as medical device raw materials, are considered biocompatible based on the requirements of ISO 10993-1:2009 for long term implants. Detailed Master Access Files (MAF) are registered with the FDA to support our customer’s submissions for regulatory clearance. For more information regarding biocompatibility testing of Solviva biomaterials, please contact our technical experts. The developers and manufacturers of immunotherapies are employing innovative bioprocessing technologies and production technologies from the earliest, small-quantity trial stages to full-scale commercialization. The demands for quality, purity, scalability, flexibility and affordability are exceptional. Single-use technology is uniquely suited to address these complex and multiple demands. Equipment changeover of plastic single-use equipment and components can be accomplished in hours instead of days—a fraction of the time and cost required for reusable, stainless steel equipment. Single-use eliminates the concerns about purity and contamination in reuse, as well as the water consumption, time and costs required for cleaning and cleaning validation. To ensure a pure environment, single-use equipment must be sterilized before use, and gamma irradiation is the increasingly preferred method. With some plastics, though, gamma sterilization causes concern about leachables and extractables, which can affect the purity and performance of biomaterials in processing and in patients. At Solvay, we are committed to providing customers with post-gamma testing documentation for our broad portfolio of high-performance polymers that demonstrates the absence of leachables and extractables and retention of mechanical properties after gamma irradiation. Ixef® GS-1022 is a 50% glass fiber reinforced polyarylamide (PARA) compound that uniquely combines high stiffness with an ultra-smooth finish that’s on par with painted metal. It can be sterilized using high-energy gamma radiation without any significant change in appearance or loss of mechanical properties. These features make it well-suited for replacing metal in single-use instruments, thereby eliminating central service costs associated with the sterilization of reusable instruments. The Look You Want. The Performance You Need. Ixef® gamma-stabilized colors give healthcare professionals a quick visual reference for differentiating instrument sizes and present OEMs with unique branding opportunities. Typical lot color chips were matched to the Pantone® Matching System (PMS) formula guide on solid coated stock based on a visual assessment. The colors shown here are a representation of the color after exposure to 40 kGy gamma radiation and should be used only as a guide. A slight shift in color can be expected between the Ixef® GF-1022 resin and the molded part that has been exposed to gamma radiation. High-energy gamma radiation is most commonly used to sterilize bulk quantities of single-use healthcare instruments and devices. Dosage levels typically range from 20 to 40 kilograys (kGy) or 2 to 4 Megarads (Mrad). Ixef GS grades exposed to these dosage levels retain their mechanical properties and exhibit significantly less color change than standard Ixef compounds. Radel® PPSU (polyphenylsulfone) is an incredibly tough, transparent plastic that can withstand more than 1,000 cycles of steam sterilization without any significant loss of properties. PPSU exhibits higher impact strength than polycarbonate (PC) and polyetherimide (PEI) and retains its toughness and strength over time. Its superior chemical resistance makes it highly resistant to commonly used cleaners and disinfectants over a broad temperature range. Opaque and transparent colors as well as with glass fiber reinforced grades are available. Veradel® HC PESU (polyethersulfone) is a durable, transparent polymer with heat resistance on par with Radel® PPSU. The material’s high flow rate makes it particularly suited for injection molding thin-walled parts and components with complex geometries. Its stiffness is the highest of all medical-grade sulfone polymers. Udel® PSU (polysulfone) is a rigid, high-strength, semi-tough, transparent plastic that offers higher heat resistance and better hydrolytic stability than polycarbonate (PC). PSU retains its good mechanical properties when exposed to oxidizing agents, steam and other sterilization techniques. Opaque and transparent colors as well as glass fiber reinforced grades are available. Ixef® PARA (polyarylamide) uniquely combines high stiffness with an ultra-smooth finish that’s on par with painted metal. Gamma-stabilized colors can be sterilized using gamma radiation without any significant change in appearance or loss of mechanical properties. AvaSpire® PAEK (polyaryletherketone) is a versatile family of proprietary formulations tailored to provide new and unique combinations of performance and value. AV-600 Series products deliver excellent chemical resistance, good impact strength and can withstand more than a 1000 cycles of steam sterilization. Glass-fiber and carbon-fiber reinforced grades are available. KetaSpire® PEEK (polyetheretherketone) is one of the most chemically resistant plastics available and offers excellent strength, stiffness and fatigue resistance. 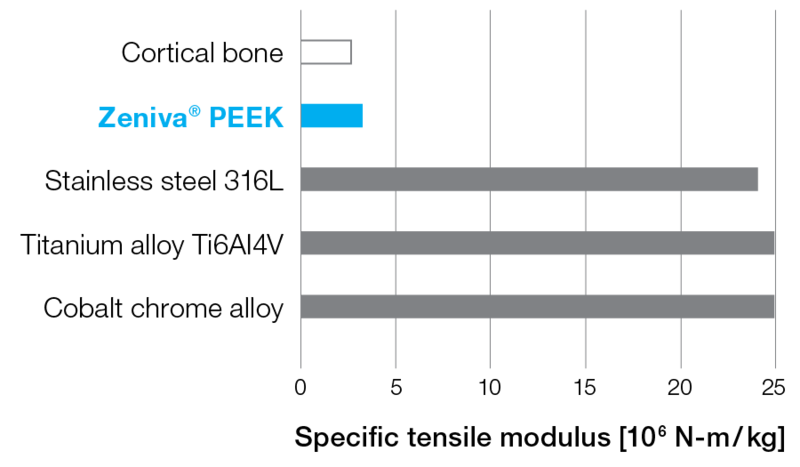 PEEK can be used continuously in hot water or steam without significant loss in physical properties. Glass-fiber and carbon-fiber reinforced grades are available. In response to strong customer demand, Solvay has added Veradel® HC A-301 polyethersulfone (PESU) to its portfolio of high-performance healthcare polymers. It is the industry’s first PESU polymer to offer an FDA Master Access File (MAF) for medical devices. Veradel® HC A-301 PESU retains its transparency and toughness at high temperatures and offers processing advantages over other commercial transparent polymers. Based on biocompatibility testing as defined by ISO 10993, Veradel® HC A-301 PESU demonstrates no evidence of cytotoxicity, sensitization, intracutaneous reactivity or acute systemic toxicity. The material is expected to pass USP Class VI testing that is currently underway. These well-documented compliance records along with FDA Master Access File (MAF) support can facilitate the design and regulatory application process for medical device OEMs, thereby accelerating time to market. Veradel® HC A-301 PESU helps balance Solvay’s portfolio of transparent, sulfone-based healthcare polymers, which have a long history of proven performance in advanced healthcare applications. Radel® polyphenylsulfone (PPSU) is a super-tough, transparent polymer that can withstand more than 1,000 cycles of steam sterilization without significant loss of properties. Veradel® HC A-301 PESU offers heat resistance that is on par with Radel® PPSU. The material’s high flow rate makes it particularly suited for injection molding thin-walled parts and components with complex geometries. Its stiffness is the highest of all medical-grade sulfone polymers. Udel® polysulfone (PSU) is a tough, high-strength transparent polymer that offers higher heat resistance and better hydrolytic stability than polycarbonate. Veradel® HC A-301 PESU exhibits properties similar to those of polyetherimide (PEI) for strength, stiffness, transparency, dimensional stability, and inherent flame resistance as well as compatibility with steam sterilization and chemical sterilants. Solvay offers the broadest selection of high-performance, medical-grade thermoplastics for limited exposure applications having less than 24 hours contact with bodily fluids and tissue. Solvay also offers Zeniva® PEEK and other Solviva® Biomaterials for long-term exposure applications that are in contact for more than 24 hours. As a leading supplier of Specialty Polymers for Healthcare for over 30 years, we also offer the technical and regulatory support that medical device manufacturers need from a trusted partner. Interested in other announcements about Zeniva® PEEK? 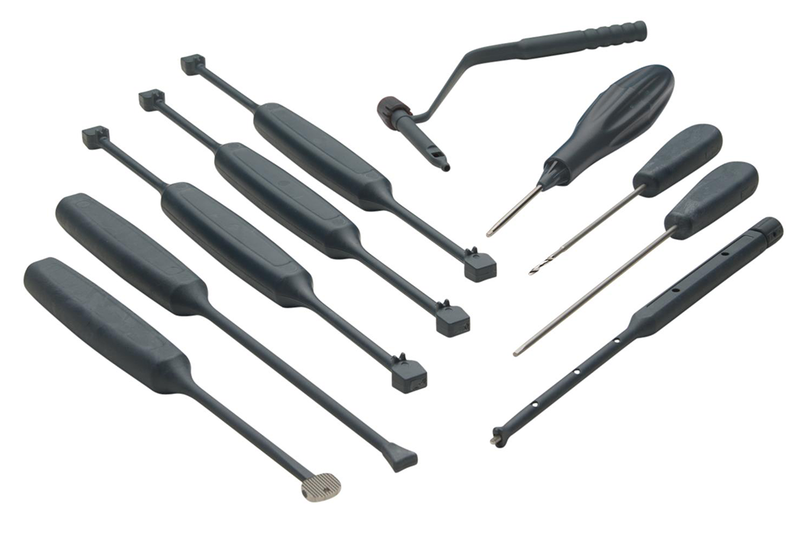 Solvay’s high-performance Ixef® polyarylamide (PARA) resin enabled ECA Medical Instruments to develop its Cervical-One™ single-use surgical instrument set for use in one- and two-level cervical spine implant procedures. 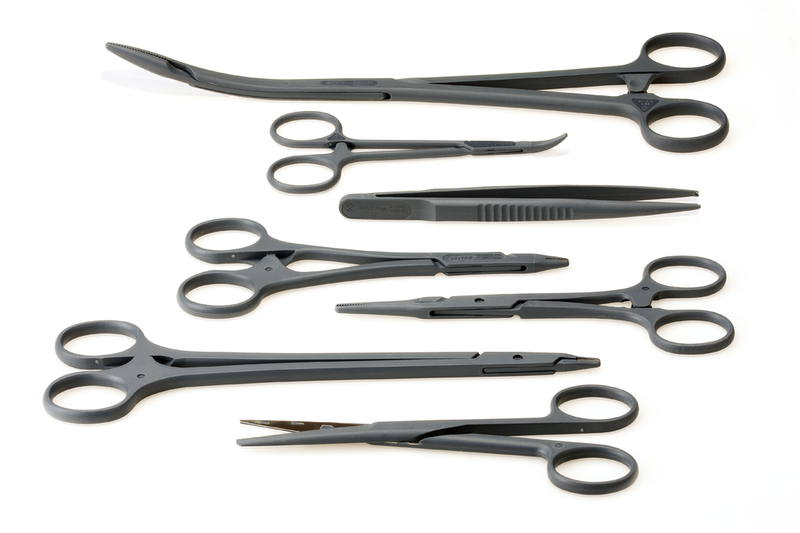 Compared to reusable metal instruments, ECA’s single-use instruments can eliminate reprocessing costs, enhance operating room efficiency, streamline hospital and ASC inventory management, and play a significant role in eliminating the root causes of surgical site infections. (Photo courtesy of ECA Medical Instruments). Compared to reusable instrumentation, single-use instrument systems like ECA’s can eliminate reprocessing costs, enhance operating room efficiency, streamline hospital and ASC inventory management, and play a significant role in eliminating the root causes of surgical site infections. Despite concerns that single-use surgical instruments may have a negative impact on the environment vs. reusable metal tools, a study Solvay conducted in conjunction with Medacta International and Swiss Climate countered these perceptions. Read more about the study. Only products of Solvay Specialty Polymers USA, LLC designated as part of the Solviva® family of biomaterials may be considered as candidates for medical applications implanted in the human body and devices that are in contact with body fluids or tissues greater than 24 hours. Solvay has not performed clinical medical studies of the use of these medical grade and products. Moreover, Solvay has neither sought, nor received, approval from the Food and Drug Administration (FDA) for their use in implants in the human body or in applications in which there is contact with body fluids or tissues. complies with all FDA and other regulatory requirements. It also is the sole responsibility of the manufacturer of the final end use product to conduct all necessary tests and inspections and to evaluate the final product under actual end-use requirements and to adequately advise and warn purchasers, users, and/or learned intermediaries (such as physicians) of pertinent risks. Any decision regarding the appropriateness of a particular medical product in a particular clinical application should be based on the judgment of the manufacturer, seller, the FDA, and the treating physician. Do not rely upon Solvay. Solvay cannot weigh the benefits against the risks of a medical device and cannot offer a medical judgment on the safety or efficacy of the use of a Solvay product in a medical application. The sterilization method and the number of sterilization cycles a medical device can withstand will vary depending upon type/grade of product, part design, processing parameters, sterilization temperature, and chemical environment. Therefore, the manufacturer of the end use final product must evaluate each device to determine the sterilization method and the number of permissible sterilization cycles appropriate for actual end use requirements and must adequately advise and warn purchasers, users, and/or learned intermediaries (such as physicians) of pertinent risks. Solvay may contractually agree to provide existing test data and other information about its products or to perform new testing of the products. Such information is to be provided, and such services are to be performed, only pursuant to a written agreement that requires the manufacturer of the end use final product to accept full responsibility for defining the scope of testing and determining the adequacy and appropriateness of the testing for the end use. Such data and information are only preliminary and are not meant to assure the biocompatibility or suitability for use of these products as actually used in the final end use product and do not relieve the manufacturer of its responsibility to properly evaluate its final end-use product under actual end use requirements, nor does it relieve the manufacturer of any of its other responsibilities described in these Guidelines. Solvay does not warrant or represent that single-use medical devices made from a Solvay medical grade product are suitable for multiple uses. If the medical device is reprocessed and/or labeled for multiple uses, it is the responsibility of the reprocessor and/or manufacturer to determine the appropriate number of permissible uses by evaluating the device under actual sterilization, cleaning, and end-use conditions and to adequately advise and warn purchasers, users, and/or learned intermediaries (such as physicians) of pertinent risks. If the FDA requires proprietary information about any Solvay Product as part of the 510(k) clearance or premarket application (PMA) approval process for the manufacturer's end-use final product, Solvay may establish a Drug or Device Master File and grant a right of reference to it, in order to allow FDA to review such information without disclosing Solvay's proprietary information to the manufacturer. An authorization to reference a Master File shall only be established pursuant to a written agreement with manufacturer. There is a risk of failure and adverse consequences with all medical devices, including devices implanted in the human body and devices that are in contact with body fluids or tissues. SOLVAY MAKES NO REPRESENTATION, PROMISE, EXPRESS WARRANTY OR IMPLIED WARRANTY (INCLUDING ANY WARRANTY OF MERCHANTABILITY OR FITNESS FOR ANY USE AS MAY BE CONTEMPLATED) CONCERNING THE SUITABILITY OF ANY SOLVAY PRODUCT FOR USE IN MEDICAL APPLICATIONS, INCLUDING AN IMPLANT IN THE HUMAN BODY OR IN APPLICATIONS IN WHICH THERE IS CONTACT WITH BODY FLUIDS OR TISSUES. NO SOLVAY REPRESENTATIVE HAS THE AUTHORITY TO MAKE ANY ORAL REPRESENTATION THAT CONFLICTS WITH ANY PORTION OF THESE GUIDELINES. If the purchaser of any Solvay products is not the manufacturer of the final end use product, it is the responsibility of the purchaser to forward these Guidelines to such manufacturer.